Harvard, Yale, and America in 1968. 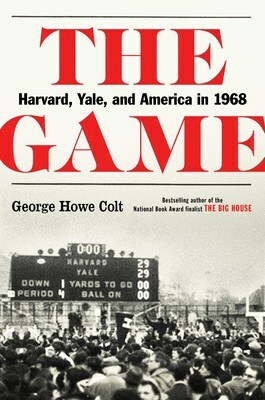 If you’re familiar with what is now known as “The Game”—between Harvard and Yale on November 23, 1968—there’s no better way to take a deep dive into the drama that unfolded that day than reading George Howe Colt’s book. The football game pitted two arch-rivals—both undefeated, with eight victories apiece—in a matchup that was to determine the Ivy League champion in 1968, not to mention bragging rights for decades to come. Yale fielded a far superior team that year (one that featured future NFL first-round draft choice Calvin Hill) and was the prohibitive favorite. And initially, it appeared that Yale might win handily, coasting to a 22-0 lead in the second quarter. But as fate would have it, Harvard came back to win, er tie, by engineering a miraculous last-minute comeback. 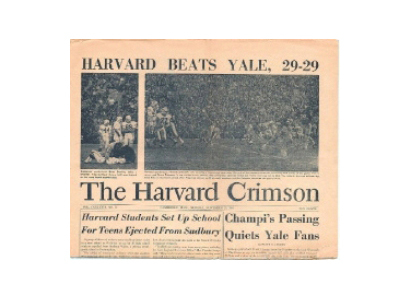 Hence the now famous headline in the next edition of the Harvard Crimson newspaper: Harvard Beats Yale, 29-29. The book takes the reader on a tour through the teams’ respective 1968 seasons, profiling key players—not to mention their respective head coaches, Carmen Cozza (Yale) and John Yovicisin (Harvard)—along the way. 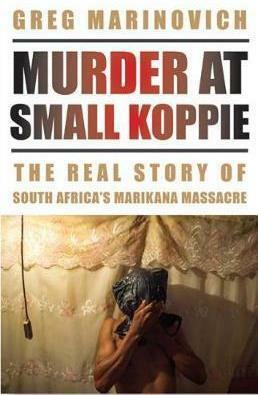 It also explores the history of the rivalry (est. 1875), and the history of each team’s football program. But the most riveting chapters are those in which Colt recounts the game in intimate detail, which ended with Harvard fans storming the field and engaging in a celebration not unlike the kind that follows the conclusion of a war, with strangers kissing and hugging each other, not quite believing what they just witnessed. Five decades later, that sentiment remains, at least among the players who are still alive. “When alumni gather and talk of games gone by, the conversation inevitably turns to 1968. Harvard people refer to it as ‘the famous tie,’ Yale people as ‘the infamous tie,’ writes Colt, who, it should be noted, attended “The Game” as a 14-year-old. The Battle of Adrianople—The Day of the Barbarians: The Battle That Led to the Fall of the Roman Empire.